Unrivalled city retreat evoking spirits of explorers, merchants and pirates! CASA MONTESDEOCA, an early 16th Century Merchant Palace, sits proudly in a superb location and offers two exclusive magnificent suites, JACARANDA and TAMARIND, both combining grandeur and comfort. The interiors are filled with antiques and contemporary art enhanced with terraces overlooking a patio with palms dancing in a warm breeze. Surrounded by cobblestone pedestrian streets and many of the finest restaurants, cafes, shops, galleries, museums, theatres, the Vegueta Food Market Hall and Cathedral of Las Palmas; CASA MONTESDEOCA feels like a world apart from the bustle of modern life, offering exceptional authenticity and beauty. CASA MONTESDEOCA adjoins the Ermita de San Antonio Abad, where Christopher Columbus stopped to pray for success before setting off to the New World. CASA MONTESDEOCA had two secret entrances to this church, of which lintels were found during restoration works. 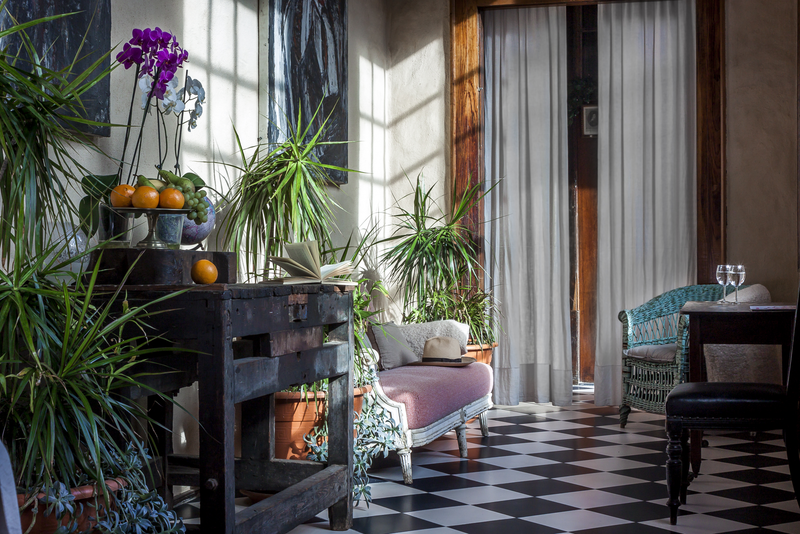 JACARANDA is an impressive beautiful apartment with intriguing interiors providing a relaxed and eclectic mix of antique furniture, 500 year old stone walls, high wooden ceilings, inspiring contemporary art and tiled terraces. Accommodating up to six guests, the apartment comprises 2 great bedrooms, excellent living room with double sofa bed, 2 spacious bathrooms, small kitchen plus sunny orangery/gallery with a large dinner table and sofa. There is unlimited free WiFi available and included are the bed linen, towels, beach towels, toiletries, hairdryer and the cleaning in the end of the stay; plus an extra cleaning in the middle of the stay when you book more than 7 days. Suitable for children over 12 years old and for babes-in-arms. A child's cot and high chair are available on request. JACARANDA has a total area of almost 100 m2. RESTAURANTE CASA MONTESDEOCA is located the ground floor patio and can be heard and seen from the terraces of the suites. A superb location for a self-catering luxury break set back from the Atlantic coast.